Last week I introduced my perspective and perception of the 21st Century Library Paradigm, which stated; The 21st Century Library will be defined by those librarians running the library to meet the needs of its local community, more than by the profession, or schools of library and information science, or by any association of librarians’ principles. This paradigm obviously deserves more explanation, but I first want to address The Paradigm vs. The Model. I stated a definition of a paradigm. Back in January this year I wrote about the 21st Century Library Model developed by professionals at the Utah State Library. The USL Mission and Strategic Plan, … [addressed] these external influences on libraries, a 21st Century Library Model emerged as a pyramid with the professional development and retraining of the librarian as its base, upon which rests the full understanding and integration of technology using business processes that form the building blocks of a 21st Century Library, that support the absolute purpose for the existence of libraries – customer centered, relevant library services for 21st Century Library customers. Is there a disconnect between the two ideas? Not in my mind. The paradigm is “one conceptual world view” of the 21st Century Library. It is overarching and general by nature, and describes a library as viewed from a broad philosophical perspective. The 21st Century Library Paradigm is the concept of a library, and the 21st Century Library Model is the blue print for a library. But, doesn’t a blue print describe a specific house? Yes. How can all 21st Century libraries be unique if there is a “model” for one? Because the blueprint contains the details for building a specific structure, which presumably has a foundation, walls, windows, roof, plumbing, etc., that makes it a house – as opposed to an office skyscraper, or a sports arena. The basic elements of a blueprint are common, but the way in which the architect assembles the specific parts to make a unique house is what makes it a unique house. Many decades ago after WWII when the suburbs accompanied the baby boom, houses were all pretty much alike – they were called cookie cutter houses. That is also a good analogy for the 20th Century Library – cookie cutter libraries. The cookie cutter library did the job of the 20th Century paradigm of the library – provide books. The 21st Century Library is no longer all about books. It has to be so much more to fulfill the vastly different information needs of its citizenry and their advanced technology and information literacy capabilities. 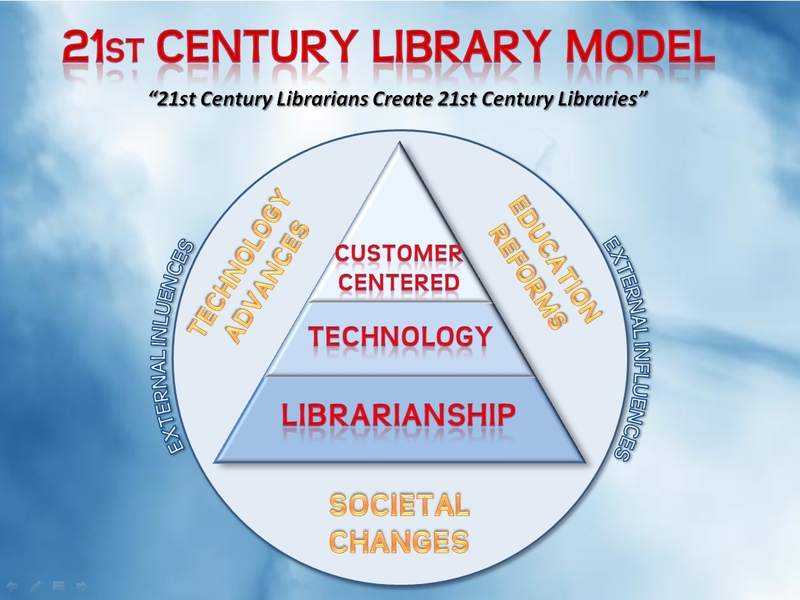 The 21st Century Library Paradigm is the concept of a library, and the 21st Century Library Model is the blue print for a library. The concept of the library defines what the blueprint of the library will create. You are the architect of your 21st Century Library.